Pregnancy is a time of tremendous change. As you carry new life into the world, you undergo an initiation into an entirely new way of being. The massive changes you experience--to your body, your lifestyle, even your relationship with yourself--will be both joyful and challenging. The Healthy Pregnancy Journal will help you navigate the beautiful chaos of your journey into motherhood with a safe space to reflect and prepare, work through all you're experiencing, and stay on track for a healthy pregnancy. 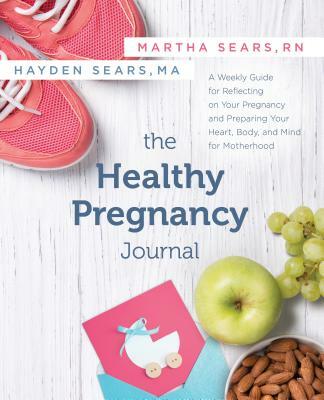 The Healthy Pregnancy Journal, by Martha Sears, RN, and her daughter, Hayden Sears, MA, of the Sears family parenting legacy, is the perfect complement to The Healthy Pregnancy Book, co-written by Martha and her husband, Dr. William Sears--parenting experts and bestselling authors of over 25 books. Martha SearsMartha Sears, RN, is a registered nurse, former childbirth educator, La Leche League leader, and lactation consultant. With renowned pediatrician, William Sears, MD, Martha is the coauthor of more than 25 parenting books, drawing on her experience with their eight children (including Stephen, who has Down syndrome and Lauren, their adopted daughter). She contributes to the content of AskDrSears.com and is noted for her advice on how to handle the most common problems facing today's mothers with their changing lifestyles. Martha lives in Southern California and is blessed to spend tons of time with her 15 (for now) grandchildren. She enjoys reading, gardening, sailing, and ballroom dancing with her husband of 53 years.Hayden SearsHayden Sears, MA, mother of three, is a certified health and nutrition coach who loves helping families and individuals on their journey toward better health. The oldest daughter of Dr. William and Martha Sears, she has worked with the Sears Family Pediatrics medical practice for over 15 years as Wellness Coordinator. She also contributes to the content of AskDrSears.com; has been a guest on TV shows and news stations sharing nutrition tips, healthy meal options, and the benefits of babywearing; and is excited to co-host the Dr. Sears Family Podcast. Hayden owns a Juice Plus+ virtual franchise and travels all over the world speaking about how to keep ourselves and our families healthy. She received her MA from Azusa Pacific University and resides in Southern California. Having homeschooled for 10 years, she now volunteers at her kids' schools and enjoys dancing, performing arts, and yoga.